The people were discouraged. The temple they were building seemed to be nothing compared to Solomon's glorious temple. So God sent them a message of encouragement through the prophet Haggai. "Be strong" (2:1-5a). Why? Because of God's presence: (a) the almighty God is with us; (b) the unchanging God is with us; (c) the faithful God is with us. "Do not fear" (2:5b-9). Why? Because of God's plan: (a) the kingdom is coming; (b) the King is coming; (c) glory is coming; (d) peace is coming. Because of God's presence and plan, we can live with unshakeable strength and courage! 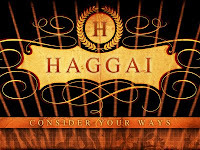 What can we learn from Haggai 1? Get involved in God's work. The book of Haggai might be known as a "Minor Prophet," but it contains a valuable message for our lives today. Over the next four weeks, I will post four messages on this obscure, yet inspiring, book of the Old Testament. God's gift is the sacrifice of His Son. God's gift is too amazing for words. God's gift is worthy of our deepest gratitude. 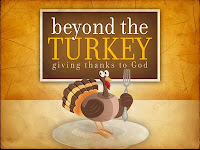 We should give thanks by doing something to show our thankfulness. "I always thank my God as I remember you in my prayers, because I hear about your faith in the Lord Jesus and your love for all the saints" (Philemon 4-5). Faith is not just an intellectual thing; faith works. Faith is not just an individual thing; faith connects. Love is not a selective thing; love accepts. Love is not a sentimental thing; love acts.